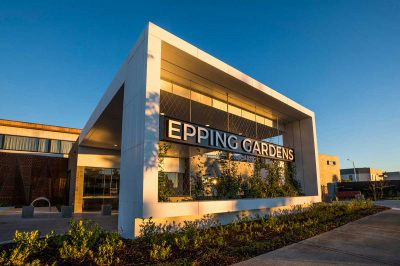 The most recently finished building within the premier business park in Melbourne’s Northpoint Enterprise Park is a state-of-the-art, $32 million, 148-bed aged-care facility, Epping Gardens. This stand-out aged care development may appear to be an unusual inclusion within a business park that until recently has predominantly housed commercial and industrial buildings. It is, in fact, a reflection of the growing trend for business parks to work towards including suitable community-focused facilities within their built environments to support and service local residents as well as workers that are drawn to the area for employment. Epping Gardens in Epping, Victoria is a state-of-the-art aged care facility with an inviting homely feel, whilst also blending with its industrial surrounds. Creating this blend of aesthetics and emotions was a unique challenge. To manage this significant task, Heritage Care commissioned Thexton Smith Architects as the designers, McMullin Property as the property developers and APM Group as the builders of their newest aged-care facility. The design challenge facing Thexton Smith Architects was to integrate an aged-care residential home into its surrounds of the 120ha predominantly industrial and commercial Northpoint Enterprise Park. Whilst the area is overwhelmingly industrial, the location of Epping Gardens is within its community-focused precinct, is surrounded by a beautiful wetland, and a growing health hub, including the Epping Medical Centre across the road and Melbourne’s Northern Hospital less than five kilometres away. Since they wanted to keep it warm and inviting, and residential in nature, Nolan Smith, Director and lead architect at Thexton Smith said they chose materials that would have a nice reference and harmony with the industrial zone. The materials palette chosen by the architects was mostly industrial and included precast panels and brick inlay for the external façade, weathering steel to the service wing, and generous use of Blackbutt timber both inside and outside, for a softening effect. “While the timber and bricks were quite residential in nature, the precast panels and weathering steel were industrial”, said Nolan. with its industrial surrounds to one side or the extensive wetlands to the other. dominant growth corridors with a projected population expected to increase by 52% in the next decade. Epping Gardens sits on Willandra Drive, Epping, alongside a new child-care facility, operated by Eclipse Child Care. Next to this and currently under development is the $70 million hotel development by the Mantra Group which will be a 214-room hotel, featuring both hotel rooms and apartments, a café/restaurant, brewhouse, conference and meeting facilities, gymnasium, and an open car-park containing 143 marked bays and secure bicycle storage. Across the road from the Mantra is the Epping Medical Centre, a custom-built, three-story medical building. It was recently announced that this building will soon also house four operating theatres and a 30-bed day procedure centre. There is also a $250M private hospital development, of up to 360 beds, to be built along-side the Epping Medical Centre, opposite Epping Gardens.